We certainly don't sail every day, and cruising mostly consists of anchoring the boat somewhere; for at least a few days (usually) that place becomes our home. 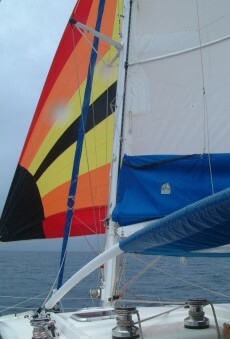 Nonetheless, we usually make a few short sails every week, and if we have guests on board we may move once a day or more. However, most of these trips are short and easy, lasting a few hours at most and usually fairly comfortable. Since even a short sail can be a bit of a procedure on board, we tend to stay somewhere unless there is a significant reason to leave. Our schedules are usually very flexible, so we tend to stay somewhere until we have done everything we want to, then we leave when we get a god break in the weather. However, sometimes we go out for a few days to enjoy an area away from town, then return for some event or to re-provision. The main exception to this is when we have visitors on board. Then, we want to show them as much as possible in the time they have, and this often means frequent sails. It should be noted, however, that we don't actually spend most of our time like that. Cruising life is mostly calm and slow, only occasionally doing something as big as moving the boat. Nonetheless, about once every few days we take a short sail, usually between two nearby islands or to another anchorage on a different part of our current island. These trips often start in the morning so that we arrive around noon, when the light is good for seeing into the water. Since Ocelot does not move very fast by land standards (10 mph/16 kmph is very good speed) even a short sail can take several hours, and we usually only make one in a day. One advantage of a relatively large boat is that we can often continue some daily activities (school, for example) while underway. In a rough sea we can do little except sail the boat and wait for conditions to improve, but usually we can read, sleep, study, or do something else to pass the time. While we do always have at least one person on watch, a crew of four plus an autopilot means most people can relax at any given time. Multi-day passages are quite different from daysails. Most passages are not very rough (thank goodness), but we have to stand night watch. Three hours out of every night doesn't sound like much, but you lose a lot more sleep that that. Everybody is groggy for the first few days, and I never seem to really adjust to the strange sleep schedule. The lengths of our passages have ranged from as short as one night to as long as 24 days. Passages are a serious disruption of our normal schedule, especially for the first few days. I usually cannot study very much for the first two days at least, unless the seas are very comfortable. 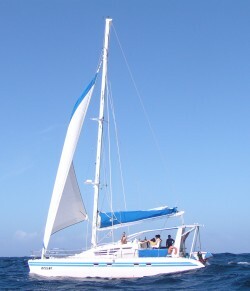 Meals and chores become a real hassle, especially in rough seas where nobody wants to be own below. The only think I really look forward to in a passage is the end of it and our arrival in a new, calm harbor.